I used to rush to the doctor whenever my child caught a cold or cough. My doctor told me that we should not give medicines to infants until its a critical issue. Common cold and cough can be cured by applying simple home remedies. It will also give strength to the immune system of baby. From that day, we are applying different type of home remedies for almost all common diseases like cold, cough, vomiting, diarrhea and fever. My son is now three and half years old. I am sharing all the home remedies that we have learned so far, we applied most of the remedies for our son in past three years. There are separate sections based on age & disease. Click on relavant link for you. Breast milk is best home remedy for curing each and every disease in infants. Some children don’t latch properly when suffering with cold & cough. Don’t worry, keep offering breast milk. You don’t really have to give any other medicine as Breastmilk is one of the simplest home remedies for cough. Lessor known use of breast milk. Some moms put few drops of breast milk in nose of child, and it helped in fast curing from cold. If you don’t know, saline water is salted water. You can even make it at home but I recommend you to buy it from market because packed saline water has appropriate ratio of salt & water. Put few drops in the blocked nose of your child. 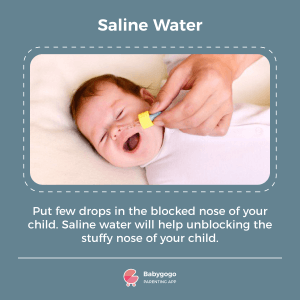 Saline water will help unblocking the stuffy nose of your child. Keep cleaning the nose. Suction pump is used for cleaning the nose of infants because cloth based hanky cotton based face towel can make rashes on soft nose of new born baby. Make sure to wash suction pump after every use. Garlic is very powerful medicine with anti-bacterial properties. Ajwain (carom seeds) also kills virus & bacterias. 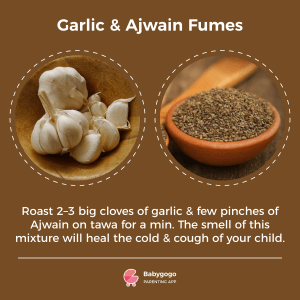 Roast 2–3 big cloves of garlic & few pinches of Ajwain on tawa for just one minute. You will be able to smell powerful fumes. Let the mixture cool down and keep near your child. The smell of mixture will heal the cold & cough of your child. You can also bind the mixture in pouch for better handling. Inhaling steam is a natural way to provide relief for blocked nose, chest congestion & cold. I will not recommend proper steam for infants using steamer. Rather keep your room little steaming by placing a steamer or boiling water near your bed. You can also make your bathroom steamy by running hot water tap for some time. Sit in bathroom for 10–15 minutes by taking your infant in your lap. You know better how to protect your child from cold. All kids are not same, so it’s better to observe your child. My son gets cold from chest and we take utmost care in winters to cover him with cloths, especially his chest. He remain okay without hat or socks. Once anyone in house is caught up with cold, make sure everyone keep their hands sanitized. It’s not rocket science but people spread infection by not keeping hands clean. It’s simple home remedy to protect your family from cold & cough. Babies feel difficulty in sleeping when suffering from blocked nose & cold. Elevate your baby’s head with help of pillow or cushion while she is sleeping to minimize the discomfort of blocked nose. 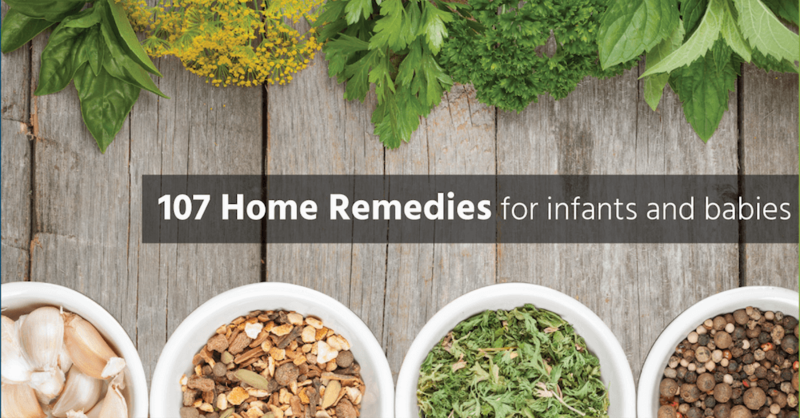 Other home remedies can work better when child is at rest and sleeping. Light massage of mustard oil or coconut oil will help your baby to get relief from cough. Do massage on chest & back of your baby. Warn up coconut oil and put some drumstick leaves (moringa). It is effective home remedies when applied on hair of child who is suffering from cold. Warm up coconut oil and add tulsi leaves. Tulsi will leave its healing properties in the coconut oil. You can also add a pinch of camphor. Mix well to dissolve camphor into coconut oil. Massage the oil on chest of your baby before sleep. You can also do hair massage with same oil. It will give relief from cold and cough. Essential oils (EOs) are extracts of plants. They can come from the roots, leaves, flowers, stems, or a mixture of these. Don’t get confused with many type of fragrance oils found in the market. Fragrance oils are synthetic, they do not have the healing properties or effects. The essential oils that are good to diffuse to help with congestion are: Cedarwood, Clove, Eucalyptus, Ginger, Lemon, Melaleuca (ericifolia), Peppermint, Rosemary, Sandalwood and Thyme. Dilute essential oils with water and put in diffuser for better results. Again, breast milk helps in fighting with fever (and it’s root cause). Don’t stop feeding your little one even in fever. Most of people ignore the power of child’s connection with mom. Child remains inside mother’s womb for 9 months and always feel comfortable near mom. We have experimented it several times since the birth of our child. A direct skin to skin contact with mom gives tremendous relief to child. Give a close hug to your child without any cloths in between. A warm bath helps bringing temperature to normal. Give your child a lukewarm bath in tub or by sponge. Add some vinegar to lukewarm water & give the bath to your little one. Soon your kid’s fever will be down. Like I mentioned in cold & cough remedies, oil massage helps in fever as well. Scientifically you have to give comfort to your child. Fever will go away when your child is in harmony. Dilute lavender oil in mustard or coconut oil. Give a light massage to your baby from head to toe. Traditionally onions are used to cure fever in India. Cut the onion into 2–3 pieces and put under the feet, inside the socks of your child. Works best when the child is sleeping. You have to understand why babies have gas problems more often than elders. When infants drink milk, air stuck into their throat & stomach. The sound of burp happens when the air is released from stomach. As they said, prevention is better than cure, always burp your baby after every feed and in-between the feed. If baby is feeling uncomfortable with gas problem, then help her in exercising by cycling legs for two minutes. Don’t do this exercise immediately after feeding but give a time gap of at least 30 minutes. Folding and pressing both legs towards stomach will also help releasing gas. We tried both methods and it worked most of the times. Light massage on stomach will help soothing your child. You can use any baby oil but I prefer mustard or coconut oil. Do tummy massage for five to seven minutes with light hand. Hing is very effective Indian home remedy for gas related issues in children. Take a spoon of warm water and put a pinch of hing into it. We can not give hing to infants directly by mouth so apply the hing water on your child’s abdomen or around baby’s navel in anti-clockwise direction. Boil some water in the pan. Soak a clean hand towel into hot water and squeeze out excess water. Check the temperature and make sure towel is not too hot for the child. Place the warm towel on the tummy of your child and it will start giving relief to your kiddo from gas problem. Whatever the issues are, breastmilk is proven medicine for infants. Keep your child hydrated by breastmilk. Don’t give any other type of external milk, not even cow’s milk. You should also look for reasons of vomit or loose motion. It could be because of some infection, teething, or just because of climate change. Try to recall what child has eaten in past 24 hours? If your child is taking formula powder then shift to soy based formula. Your child will have lesser rashes with soy based formula and it will help in fast recovery from loose motion. Gripe water is effective remedy for diarrhea in babies. Gripe water gives relief to stomach and help curing loose motions. It’s not recommended to children below 4 months but if your child is able to sit and started consuming semi-solids then give some curd and buttermilk. Curd has natural probiotic that help curing stomach related issues. Prevention is always better than cure. Try these super effective immunity boosting foods to stop the cold and cough before happening at the first place. Steam is the first thing you should try in case of cold & cough. Inhaling steam helps to clear baby’s blocked nose and open blocked airways. It helps your baby to sleep better and speed up recovery from cold , cough & congestion. You can use room humidifier or steamer to keep room air moist. Avoid to keep your baby close to hot & steamy water. Dry roast 2–3 garlic cloves & one tablespoon of ajwain on dry tawa or pan. Once its roasted, switch off the flame. Make a potli out of it. You can place potli around baby’s bedding or in his cradle during sleep time. The garlicky ajwain smoke helps to get relief from blocked nose & chest congestion. Turmeric is one of popular home remedies for cold & cough. The antibacterial properties of turmeric makes it an effective solution to treat cough and cold naturally. Take a dried turmeric root, burn it and make a turmeric powder from it. Apply the turmeric paste(turmeric powder & few drops of water) on the baby’s nose to get relief from blocked nose. Make a turmeric paste by mixing half teaspoon of turmeric powder with 1 tablespoon of water. Heat it up on flame & apply the warm turmeric paste on baby’s chest, neck, feet. As turmeric has antibacterial properties, it helps to get relief from phlegm, congestion & cough. Mustard oil has medical & antibacterial properties. Its a safe & effective way to cure cough & congestion in children. Put one or two garlic cloves in mustard oil and heat the oil. Once the oil is lukewarm, rub it on baby’s chest & feet. Warmth & smell of mustard oil helps to get quick relief from nasal congestion and cough & cold. You can also heat the mustard oil with a teaspoon of rock salt into it. Once the oil is lukewarm, rub it on baby’s chest, back & feet. Nilgiri oil, also known as eucalyptus oil, a good remedy for a cough and cold. Eucalyptus oil helps increase circulation in the body, helps expel phlegm and decongests the blocked airways. Nilgiri oil helps to keep nose moist. Just sprinkle few drops of nilgiri oil on baby’s clothes or on some handkerchief n keep it around baby. Add one or more essential oils to a carrier oil and run some on your baby’s feet or chest. A few that should be safe to try are eucalyptus, lemon, and sandalwood (peppermint is not recommended). Rub Vicks Vaporub to bottom of your baby’s feet and chest at night, cover her feet with cotton socks. Your baby will get instant relief from cough. VapoRubs actually don’t remove congestion, it makes baby feel better with its cooling action. Tulsi juice helps to get relieve from cough, cold and fever. Boil few leaves of tulsi into water & give this water to your baby or you can add 2–3 spoons of tulsi water into baby’s milk. Boil 4–5 tulsi leaves and one badi elachi (black cardamom) in one cup of water. Once boiled, strained and let it cool down. Feed two teaspoons of this water to your baby. If you are giving top-up milk / formula to your baby then you can add 2–3 teaspoons of it to milk. Panikoorka is an Ayurvedic herb, commonly used in south indian states to cure cough, cold, sore throat, nasal & chest congestion in children. Boil the leaves of panikoorka for 4–5 minutes in 1 cup of water. Once cool down, feed 2 tablespoon of water to children. Its a very effective remedy to treat excess phlegm. Water boiled with ajwain seeds is a good remedy for cough. Give this water on regular interval to your baby to keep him hydrated. Cumin seeds have essential oils that can prevent viral infections & helps to cure cough & congestion. Cumin seeds strengthens immunity system as well. Boil cumin seeds into water & give it to your baby when lukewarm. Carrot juice contains essential nutrients, a rich source of antioxidants, vitamins and minerals. Nutrients found in carrot juice helps to control whooping cough. Extract the juice from fresh carrots, dilute it with filtered water & feed it to your little one. Give seasonal vegetable soup, kala channa soup, dal soup or tomato soup to your baby. Warm soups give warmth to your baby’s chest and throat. Warm liquids / soups can be very soothing and helps to relieve congestion. Chicken soup helps to increase immunity & relieves cold symptoms like congestion. A best home remedy to give warmth to your baby during winter season in south India. Prepare tomato rasam for babies during cold & cold. Boil 1 cup of water with Tulsi & jaggery in it with a pinch of black pepper and small piece of ginger. Once it remains half in quantity, switch off the flame. Let it cool down at room temperature, strain and feed it to your baby. It works like magic for treating cough, cold & fever as well. Breastmilk is best remedy for a sick baby. Drinking lots of other fluids along with breast milk will keep your baby hydrated during fever. Give your baby a plentiful supply of breastmilk / formula. Take two pair of socks. Dip one pair of socks into egg whites and cover the little one’s feet with it. Now put second pair of socks on the wet socks. It will immediately bring down the temperature. Onion is great to treat cough, cold & fever. Just grate small piece of onion, make one spoon of juice from it. Feed it to your baby and his fever will be down soon. Its effective home remedy for infants. Fennel seeds stimulate the production of gas in the stomach and gives quick relief from stomach problems like bloating, gas. Boil one tsp of fennel seeds into one cup of water. Allow it to boil for 10 minutes on low flame. When cool down, strain it & give two tsp of fennel seeds water to your little one. Give it on regular intervals. Give ajwain water to your baby to get immediate relief from gas & stomach ache. Boil one tsp of ajwain to one cup of water. Add pinch of salt into it. Now feed 2–3 spoons of this water to your baby at frequent intervals. First & foremost used home remedy for gas problems in infants. Add very little bit of asafoetida to warm water & give this water to your baby. Gas would come out and baby would be gas & colic free. Cumin seeds has properties to give relief from gas problem. Boil small spoon of cumin seeds in one cup of water. Let it cool down & give it to your little one at regular intervals to relieve gas . Gripe water is commonly used to treat stomach discomfort & soothe colic. It gives relief from gas problem & indigestion. Gripe water actually is a mixture of water & various herbs like fennel, ginger, cardamom, chamomile. Ginger is always a great solution to relieve the gas and stomach discomfort. But use it very carefully for infants. Avoid milk or milk products for three or four days until baby is not recovered from diarrhoea. The intestines will not be able to digest milk & its products during loose motions and consuming it will lead to increase in motions. Give your baby plenty of fluids. Babies tend to dehydrate faster than adults. Give your baby ORS (Oral Rehydration Salts). ORS is a special combination of dry salts that is mixed with safe water. It helps to replace the fluids lost due to diarrhoea. You can buy ORS sachets from market or make ORS at home. Give pomegranate juice at regular intervals.This will help in rehydrating the child. If you think, juice is too heavy for little one then dilute it with water and feed your baby at regular intervals. Give your baby sabudana water which helps to control motions in babies. Process to make sabudana water is as below. Soak sabudana for 1 hour. Then put sufficient water and keep it on boiling till sabudana get completely immersed in water. Give this water to your baby to cure loose motions . Curd helps to cure diarrhoea. Give your baby fresh curd/ dahi with roasted cumin seeds/ jeera powder. Or you can add half teaspoon of sugar and pinch of salt and give it to your baby. Give your baby mashed banana. Or you can try to give banana with a little curd. It is the most traditional home remedy to stop motions and it works wonders. Banana provide strength and energy. Boil Aniseeds (Saunf) in one cup of water till it starts leaving green color. Give warm water with a pinch of black salt to baby. Papaya is best fruits to eat when stomach is upset. You can make a routine of giving papaya to your child in the afternoon or morning to keep his stomach fit. Curd is very good when your child has an upset stomach. Curd contains bacteria that helps in curing stomach diseases. Keep giving curd & salted lassi few times that will keep your child hydrated. Lemonade helps keeping your child hydrated. Add lemon, black pepper and honey to make a healthy lemonade for kids. In winters, you can make carrot juice if your child is suffering from loose motions or vomiting. Honey can be given to children above one year of age. I don’t recommend any honey based remedy for babies under one year because honey may cause a disease called botulism in infants. Honey is the first remedy we give to our son in case of cold & cough. Just give one spoon of honey with lukewarm water for best results. You can also dissolve honey in warm water. Note: Remember, never heat up honey directly on the flame. Not even with water or any other thing. Squeeze few drops of ginger juice and add into one spoon of honey. Give it directly or dissolve in warm water. Some kids don’t like honey, so it’s better if you start offering honey to your child at early age. He will develop the taste of honey. Garlic is very powerful medicine for cold and cough. Make a paste of garlic and add honey to make it sweet. Give to your child in case of cough and cold. Add 1/2 teaspoon of lemon juice & 1 teaspoon of honey into one glass of lukewarm water. Stir well and give to toddler at regular intervals. Cinnamon has great healing properties. It is best if you start adding a little bit of cinnamon in daily food like dalia, kheer and soups. Your child will develop immunity against many type of colds. You can add two pinch of cinnamon into one spoon of honey and give to your child in case of cold & cough. Give some warm water after cinnamon & honey paste. Boil cumin seeds (jeera) in one glass of water. Add some grinded black pepper and jaggery for sweetness. Its an effective & safe remedy for cold and cough. Root of turmeric plant is useful to treat dry cough. Roast the turmeric root and ground it in to powder. Take about 1-2 grams of roasted turmeric powder along with honey twice/ thrice a day to treat dry cough. My mom used to give me haldi milk whenever I had any kind of illness. Turmeric is used in ancient times to heal many diseases.Turmeric has antiseptic properties & do wonders to treat common cough & cold. Add 1/4 teaspoon of haldi into boiling milk. Give lukewarm milk to your baby before bedtime. Your kid will feel better very soon. Note: Avoid milk if your child has a lot of phelgum. Who doesn’t know the benefits of kesar milk? Add 3-4 flakes of saffron in milk and boil for 5-7 minutes. Give warn saffron milk to your child in case of cold. Boil 5–7 tulsi leaves and 1/2 inch piece of grated ginger into 1.5 cup of water. Boil till water reduces to half. Cool and give to your toddler. Boil betal and tulsi leaves together for 5 minutes in one glass of water. Give the syrup to your child 2-3 times a day. You can make many type of soups (Kada) with Indian herbs. Boil few leaves of tulsi with ginger until you see a change in color. Add two pinch of grinded black pepper. Serve while the soup is warm. Home remedies are very simple to make. Cut ginger into small pieces or crush it. Boil ginger in water and add two pinch of pepper. Cough syrup is ready. Take a glass of warm water and add a spoon of honey, a pinch of cinnamon and few drops of lemon. Make sure you don’t boil water after adding honey into it. Serve while warm. Roast few cloves on tawa and grind to make a powder. Add a pinch of powder to honey and give to your child. You have to work with clove very carefully as cloves are very strong in nature. You have to experiment with few remedies to find which works best for your child. It also depends on reason of cough & cold (why your child is having cold & cough). We have discussed in many remedies that onion has anti-bacterial properties. You can squeeze juice of white onion and give to your child. If your child feels bitter taste then add some honey to make it sweet. Take just one bhindi (lady finger) and cut into small pieces. Boil in one cup of water for 5 minutes until you see thick soup like formation. This simple recipe is effective in curing cold for your little one. Make powder of cumin seeds. You may add honey and give it to your child with warm water. It helps in cold, cough, and stomach related problems. You can find ginger powder in the market or make it at home. Cut the ginger into thin slices and keep it in sun. Make the powder in grinder and store in air tight container. Give two pinches of ginger powder to your child with warm water. You can mix with cumin powder and honey. Most of children don’t eat ghee directly but you can try if other remedies are not giving you result. Warm up one spoon of ghee and add a pinch of black pepper. Give it directly to your child. It will give relief to throat of your child. Children may hate some of remedies mentioned here but they love dates. Give two or three dates per day in case of cold & cough in winters. For summers, we have many other remedies. Cinnamon & Honey remedy is good for chest & stomach related problems in kids. If your child is vomiting or having loose motions, then give a spoon of honey with a pinch of cinnamon powder. Ginger is another herb that helps in healing stomach related issues. Add few drops of ginger juice into a spoon of honey and give to your child with water. Tulsi tea is easy to make. Just boil few leaves of tulsi into one glass of water. Serve while it’s warm. Boil few leaves of mint into water to make a healthy tea. You can use green leaves or dry leaves. Strain the water & offer the tea to your child. You can add lemon and honey to make it tasty. Like mint tea, you can prepare coriander tea by boiling dry or fresh leaves of coriander. Amla helps in curing many stomach related diseases but it is difficult to eat for children. You can squeeze few drops of amla juice and add some honey to sweeten it. Your kid gonna hate it but you can try once as karela juice can kill many trouble making bacteria in stomach. You can add honey to change the bitter taste of karela. Don’t throw pomegranate seeds if you are making juice at home. Grind the seeds and add kismis to make remedy for loose motions. Nutmeg is powerful herb for healing vomiting. Boil one tea spoon of nutmeg in a cup of water. Offer the drink while it’s warm. Garlic is one of the best remedies for stomach. You can give it to babies above 1 year of age. A little rub of garlic along with jaiphal (nutmeg) can be given to baby. If your baby is having fever without cold then you can give him ice cubes to keep in mouth. Check layers of cloths on the body of your child. Depending upon weather reduce the layers so that some air can pass through cloths. In winters, replace nylon/leather based cloths with cotton & wool. Loose cloths will help bringing down the fever a little bit. Take a conscious decision. You can cut ginger into a small piece and ask your child to keep ginger in his mouth for few minutes. Run a pinch of salt or sugar to make it tasty. You can also dip ginger piece into honey. Add ghee and turmeric to jaggery to make dough like consistency. Make small balls and give to your child in winters to protect from cold. You can add a few drops of medicated vapors into steam water. Most of the healing work will be done by steam and vapors will help in breathing in case of stuffy nose. Kids over 4 years can gargle with warn water that helps in case they have soar throat. You can add two spoons of honey and few drops of lemon into warm water. Your child can gargle and drink this healing water. Add one pinch of salt and one pinch of turmeric into warm water. Ask your child to gargle few times a day to heal throat and cold. You can buy masala tea from the market or just add ginger, cinnamon and black pepper into regular tea. If no remedy works for your child, then make cough syrup at home. Boil saunf, mulethi and badi elaichi for 10-15 minutes. Let the syrup cool down. Add a spoon of honey while the syrup is still warm. Offer to your child 3-4 times a day. It will definitely help fighting with cold and cough. The folks at sheroes have written a really nice piece on home remedies for diaper rash. 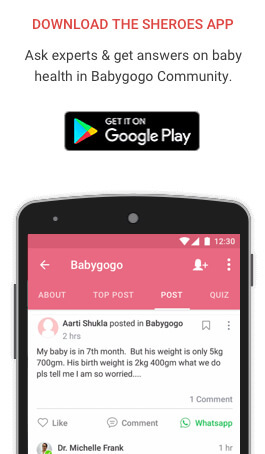 If your baby is also having diaper rashes then do check it out. how can i clean his tummy? my son is around 3 months old and he has loose motion and just producing yellow water in place of stool , please tell me any remedy nothing working no medicine nothing. i have 5 year baby girl, from last 1 month my baby suffering from cold anf nose blockage. pls suggest me waht can i do. Loved and agreed to the all points you mentioned in the article especially about the importance of breast feeding to cure cough. Breast milk is rich in antibodies specific to baby’s environment. This is the main reason of why breastfed infants have fewer infections than those formula fed. Now my son is 3 and half yr he suffering fom indigestion befor 3 day pl tell me what cn i do ? Please try reducing the amount of food containing spices, oil etc for a few days. Increase liquid diet along with plenty of fruits and veggies. Give smaller meals spaced out better during the day. Reduce the consumption of dairy products, but yoghurt is essential. Consult paediatrician if it continues. I really suffering from cough even i have finished a lots of cough syrup.but still not getting relief. Please expand a bit how can I give Light Steam to my baby. Would be grateful. Thanks. Superb home remedies. I came here looking for paathi vaithiyam for cold and cough. Though it is not in Tamil, it’s still very useful. Thank you for the compliment Dhivya. Glad that you found it useful. Do go through our other articles. 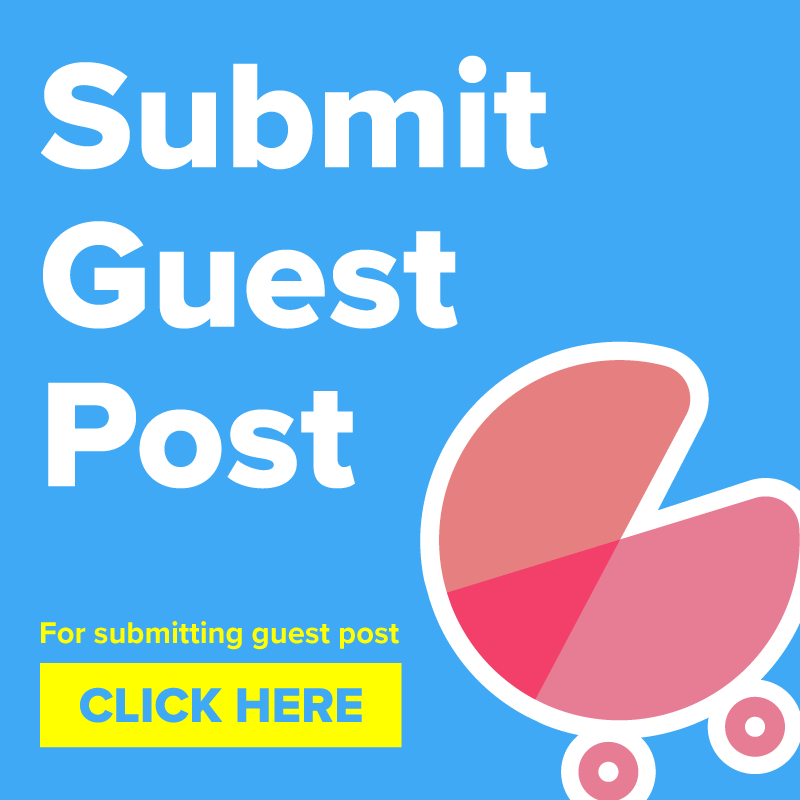 Very useful blog.it will cure my child issue.thank u. Thank you Selvi. Compliments by users such as you, is what keeps us going. Keep Commenting and helping other Mommies such as you. Great blog! Thanks for sharing. I think this is really helpful especially that kids easily get sick. Thanks Deepika. Glad you liked it. The best article on home remedies. I don’t have to read any other article. Saving in my bookmark forever.